Get in the spirit with these holiday happenings in and around Stockton, California in December. December is here and 'tis the season to be jolly. While we don’t get any snow in the Central Valley, we definitely know how to celebrate the holidays right! One of the hardest things to do is to pick what you’ll actually be doing! Here are the best things to do selected by Visit Stockton this holiday season. Ho! Ho! Ho! Where is Santa? Well, Santa Claus has landed at your favorite Stockton shopping centers! During Santa’s brief time away from the North Pole, children can stop by to whisper their wish list, and then have their magical moment captured with Santa. Check out Santa's schedule at Sherwood Mall and Weberstown Mall. Need more places? Here is a list of places where you can track him down in Stockton this holiday season. Get into the holiday spirit by visiting a Weber Point Events Center on December 1st for a Holiday Tree Lighting Ceremony and Lighted Boat Parade spectacular! Festivities at Weber Point start as early as 4 pm and will include an evening of live caroling, horse carriage rides for the kids, and a light show under the canopy. Be sure to locate your favorite viewing spot, as festively decorated boats and yachts will arrive at approximately 6 pm! Bonus: Find a unique holiday gift this year, the Annual Holiday Stockmarket is now in conjunction with the Holiday Tree Lighting Ceremony! Meet the ladies of Junior Women’s Group, as they transform the Haggin Museum into a Christmas wonderland on December 2 complete with imaginatively decorated trees, sleighs, festive floral arrangements, and the kids love the opportunity to have cookies and milk with Jolly Old Saint Nicholas! Learn more. As seen on PBS! An Irish Christmas is a journey through Christmas in Ireland with an evening of Irish dancing, traditional music, and singing all in celebration of the international spirit of the holiday season. This performance comes to the Bob Hope (Fox) Theatre on December 8th.. This is an ideal performance for the holidays, combining the warmth of the Christmas season with cultural costumes. Learn more. Take a break from all that shopping and see “A Christmas Story” at the Bob Hope (Fox) Theatre on December 9th. The humor can be both juvenile and smart, making it relatable and appreciated by all ages. This show will definitely get you into the Christmas spirit. Learn more. It wouldn’t be the holidays without The Nutcracker. Join Clara and her Nutcracker Prince and relive the wonder of this holiday classic performance performed on December 8 by Capitol Ballet Company at Warren Atherton Auditorium and on December 22 by Pacific Ballet Company at the Bob Hope Theatre. Bells will be ringing and the choir will be singing when the Stockton Chorale will join the Symphony for a spectacular afternoon of contemporary classics and traditional favorites, including the Parade of the Wooden Soldiers, music from The Polar Express, The Nutcracker, the Messiah, and more! The Stockton Symphony's “Pops 2: Holiday POPS" will be held at 2:30pm on December 16th at San Joaquin Delta College's Warren Atherton Auditorium. Learn more. Wear your holiday sweater to the Stockton Heat game on December 19th. Hockey fans are encouraged to wear their "ugly" holiday sweaters to the game as the Heat battle the Bakersfield Condors at 7pm, while also getting into the holiday spirit. Learn more. Take the kids to Lincoln Center between November 23 through December 23 for a wonderful holiday experience, each weekend through Christmas Eve! 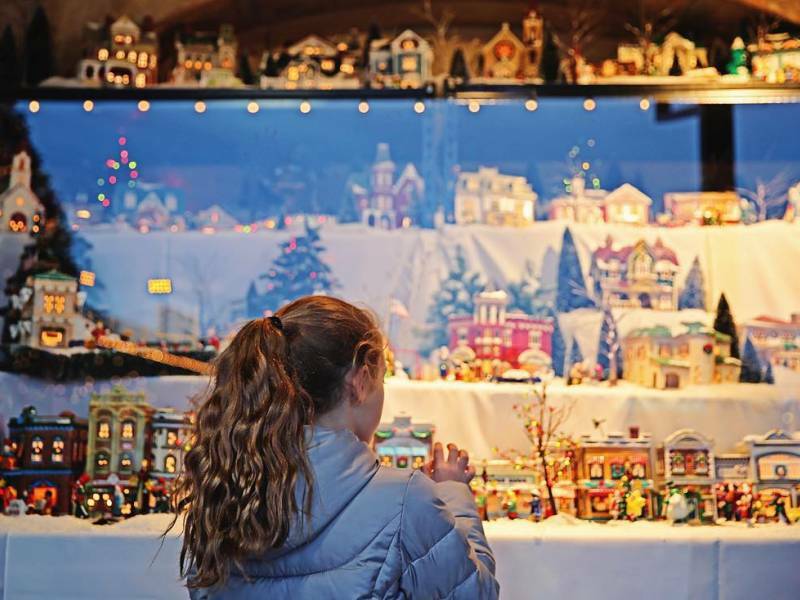 The Winter Wonderland experience features holiday train rides, snow on the Brickwalk, carriage rides, and the cherished Snow Village Display on 277 Lincoln Center. Check out the schedule here. Discover more holiday-related events by visiting visitstockton.org/events. Check out the largest events calendar in the area to plan your holiday activities! Need more recommendations this holiday season? You can also text us 7 days a week, 8am to 8pm at (877) 778-6258 and you'll receive a live response from a member of our team.